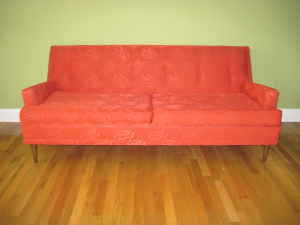 Atomic Lilly Ranch: Craigslist Couch... Yea or Nay? Craigslist Couch... Yea or Nay? So, I was looking on Craigslist (probably while on the phone with my mom who was probably also looking on Craigslist) for vintage sofas. I troll Craigslist pretty regularly because it's like thrift store shopping from work. I never follow up on anything, aside from that one estate sale I saw advertised there... But I found two lovely vintage sofas that seemed like they were in great shape and had fairly reasonable prices. After e-mailing the sellers (just for kicks) and getting fast responses from both, I decided one was not in good shape (a vintage sectional that looked like it needed to be reupholstered=$$$$) and the other was lovely, but just too expensive. Fast forward to now, the seller of the too expensive sofa just sent me an e-mail with three simple words: "Make an offer?" Whew. I'll talk to Justin about it, but I'm not sure what to do... This sofa is kind of far away, and we'd surely have to procure a bigger vehicle to get it home. BUT, the color seems like it would be fantastic in our living room, since it would bring out the reddish color of our Eames chairs. And it would mean we could move the current living room couch into the basement for our TV den that we will some day complete. It was listed for $500. What do I even offer??? Do I even want to offer??? I have been thinking that maybe we should just go new couch to avoid the ick factor, but this couch is tempting. I love it. I've gotten over my fear of "used" stuff. It's all I want now! If the cushions/support/fabric are in good shape (and it's comfy), then it's worth checking out. I usually like to drive out and check things out before I take a truck out to actually pick up. Just in case it doesn't look too good in person. What about offering $350? Lesley, I agree. The only issue is that the photos are teensy, so it is admittedly a little hard to tell how great the condition is. It looks good, and the seller promises it is... My other concern is that it looks like the fabric has a damask pattern. I'm not sure if that would work in our house... There's a big sale this weekend at our favorite vintage store, so I think I'm going to see what's going on there before going to see this one. Thanks for weighing in! Your blog is fantastic. Cheers! 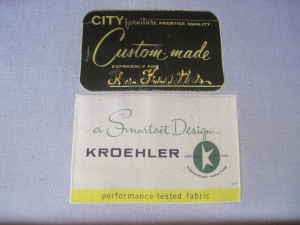 Do it, buy it, and reupholster it down the road!!! My best furniture was obtained through Craigslist! I love craigslist, however I'd be paranoid about unmentionable bugs. P.S. I'm watching your episode of Curb Appeal right now. Ladies, I have to pass on this. But we did go and scout the Macy's Corona sofa/loveseats while we were mattress shopping this weekend. Fair prices and they are gorgeous. Have you seen them? Oh, and thanks so much for stopping by!